Protomelas sp. Spilonotus Tanzania Blue Gold goes by a number of different names in the industry. 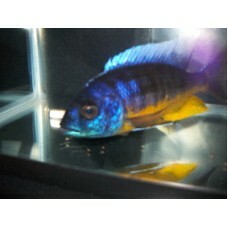 Males are blue with a yellow/orange area on the lower rear portion of their body and lower fins. This area starts out yellow and turns gold with age. This results in the confusion of different names for the same fish. Females are silver with a black vertical line dividing the body in half. Some males can take up to 4" to show full. color. My strain of this fish tends to color up earlier than some other strains. Last, grow out count 03/22/2019. Next, grow out count due: 04/12/2019. 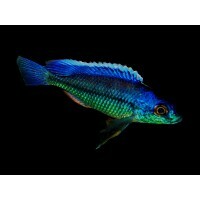 This fish is bought in from my Wholesaler in 3-3.75" males or larger sizes and no longer being grown out in-store. They may appear on a special order list as well. Base Price is 3" Male. 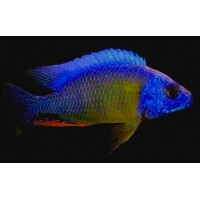 Peaceful to Mildly Aggressive Hap that mixes well with a number of other fish including Aulonocara Peacocks, Other Malawi Haplochromines, Mild Mbuna, and peaceful to mildly aggressive Lake Victorians. Protomelas marginatus Turquoise is a rare haplochromines type fish from Lake Malawi. 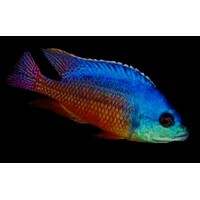 Males have a bl..
Protomelas taeniolatus (Fire Hap) (Super Red Empress) is a German line bred version of Red Empress. ..